.. examining demographic-economic patterns .. use the interactive tables described in this section to examine, view, compare, rank and assess demographic-economic patterns and characteristics of interest for wide-ranging geography based on ACS 2014 data. It is very important to understand the demographic-economic make-up and patterns for wide-ranging geographies. Community and neighborhood challenges and opportunities are shaped by demographic-economic dynamics. Knowing more about “where we are now” is essential to understanding needs for policy and program management. The quality and precision of business marketing and operational plans and decisions can be improved using these data. School districts can better understand their school district community using these data. Elected officials and policymakers can better understand the needs and characteristics of constituents who they represent. Students can benefit by using these data in studies and research by attaching real world data to support, document and analyze topics of interest. 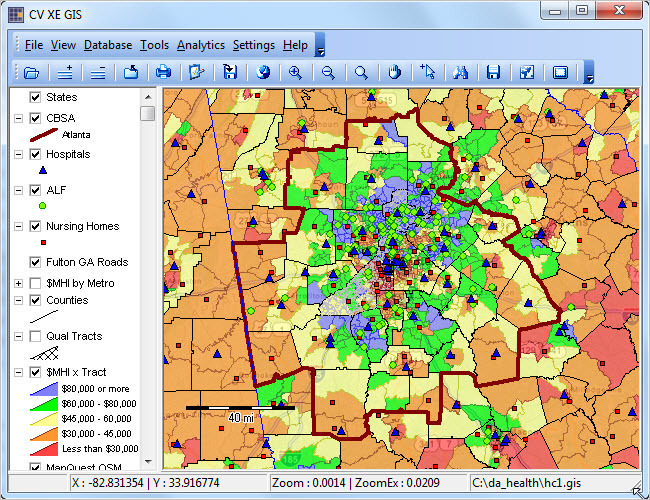 Illustrating integration of data in tables using GIS tools & geospatial analysis. 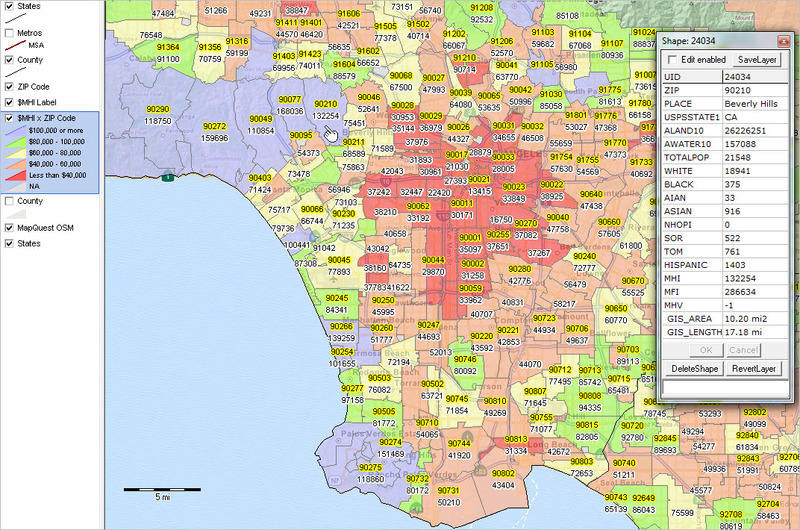 Larger view illustrates ZIP code area labeling and use of mini-profile feature. ProximityOne has developed these interactive tables as part of a broader set of data analytics tools and data resources. Data shown in the tables are available in dataset structure (CSV, DBF, Excel) on a fee basis. 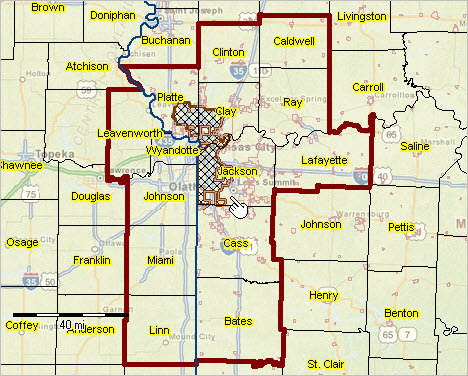 These data are also available as data integrated into shapefiles for GIS applications and geospatial analysis. 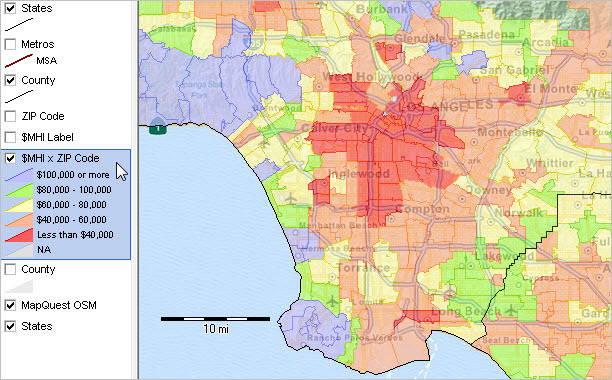 Most geographic table sections also provide access to ready-to-use GIS projects/datasets. These data are integrated with yet other data to develop/update the Situation & Outlook database and information system, ProximityOne Data Service,Situation & Outlook Metro Reports and other products. These data are also used in the ProximityOne Certificate in Data Analytics and custom service/study applications. • ACS 1-year estimates (for areas 65,000 population or more) become available in September; e.g. the ACS 2014 1-year estimates became available in September 2015. • ACS 5-year estimates (all geographies) become available in December; e.g. the ACS 2014 5-year estimates became available in December 2015. • See this section for more information about 1-year versus 5-year estimates and comparing ACS data over time. 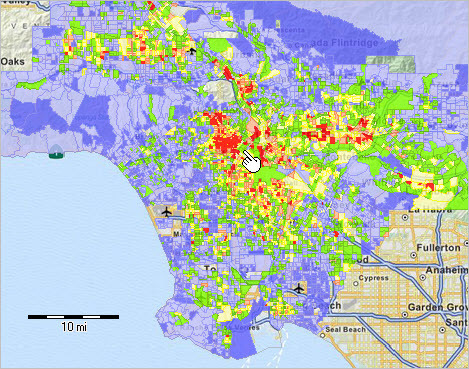 .. examining crime incidence and socioeconomic patterns and analyzing small-area and location-based data. 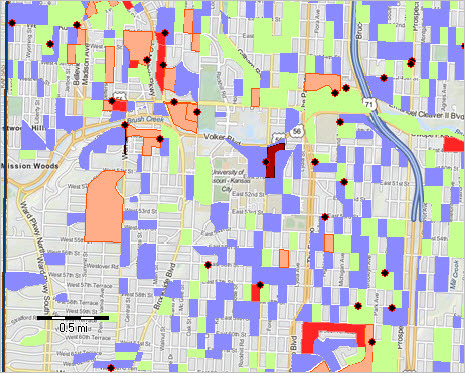 .. what are the crime patterns in neighborhoods or areas of interest? It is challenging to get useful answers to this type of question. Crime incidence data by location/address are often difficult or not possible to obtain. Even where the location-based crime data are available, the data must be geocoded, e.g., assigned a census block code to each address. Separately demographic-economic must be organized to examine contextually with the crime data. Crime Data Analytics. 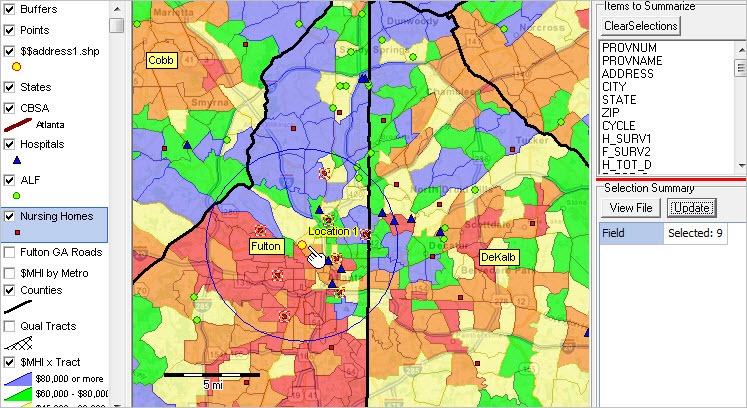 Use the Crime Incidence and Socioeconomic Patterns GIS project and associated datasets to explore relationships between crime and small area demographic-economic characteristics. Follow the steps described below to study patterns and relationships in Kansas City and/or use this framework to develop similar data analytics for other areas. Framework for a case study. 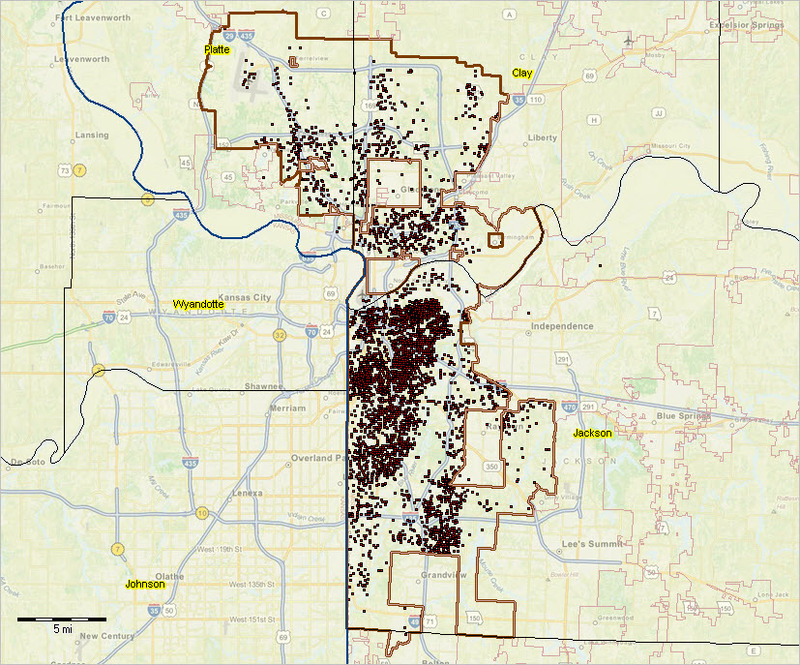 409 of Missouri’s 4,506 block groups are within the jurisdiction of the Kansas City police department (KCPD) and had one or more crimes in 2014 (latest fully reported year). 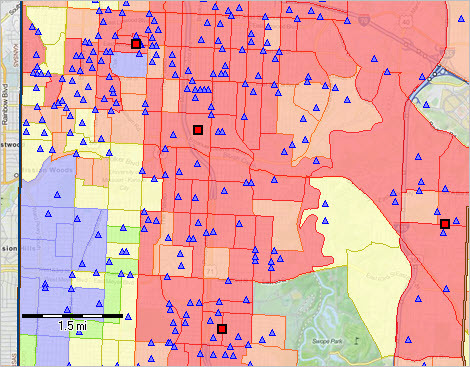 There were approximately 10,400 crimes recorded by the KCPD in 2014, in the city area spanning four counties. 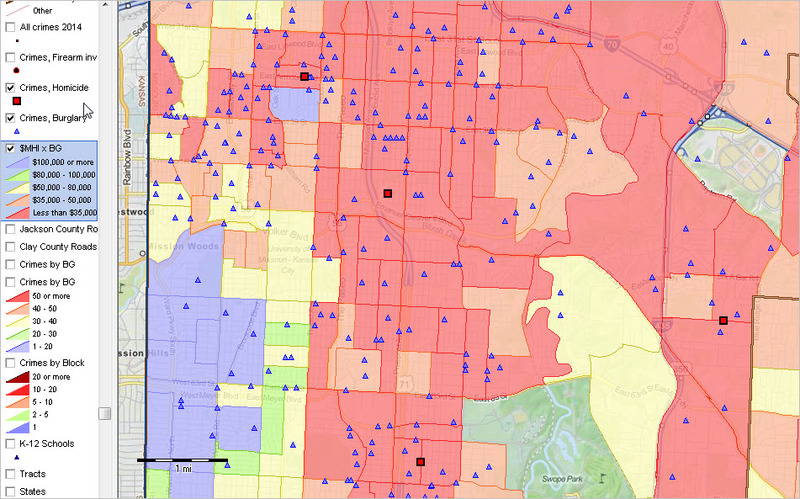 In this section tools and data are used to examine crime patterns in Kansas City, MO. 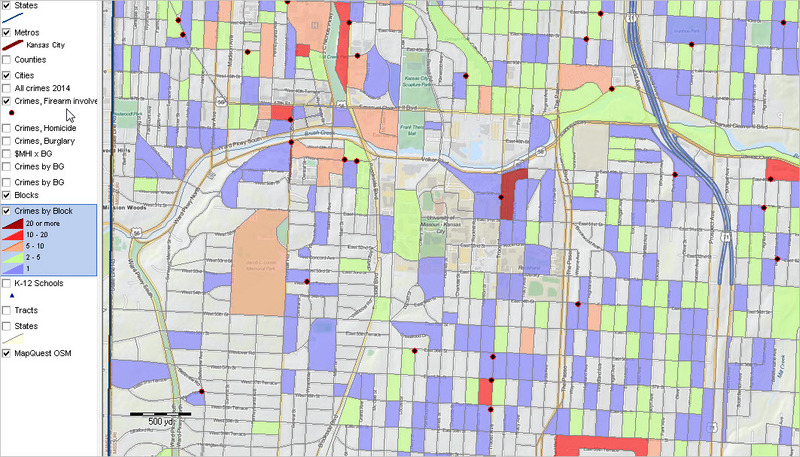 Crime data are included as markers/locations in a GIS project. Crime data are also aggregated to the census block level and examined as summary data (aggregate crimes by census block). Crime data are related to American Community Survey (ACS) 2014 5-year demographic-economic data at the block group geographic level. 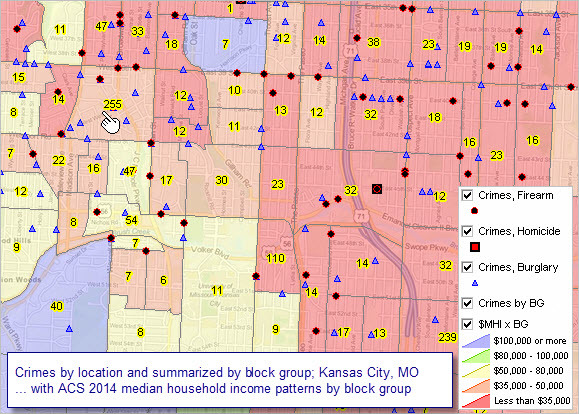 The following graphic shows patterns of crime incidence by census block for the “Plaza Area” within Kansas city. 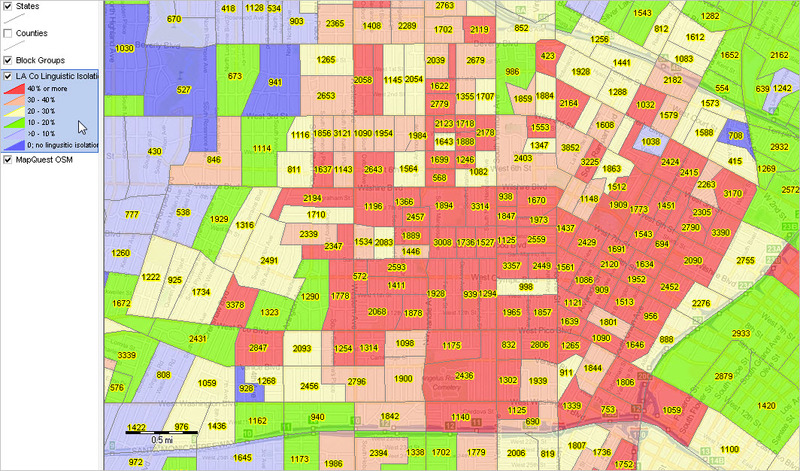 This view shows all types of crimes aggregated to the census block level. Crimes committed where a handgun was involved are shown as black/red circular markers. Click the graphic for a larger view that shows legend and more detail. 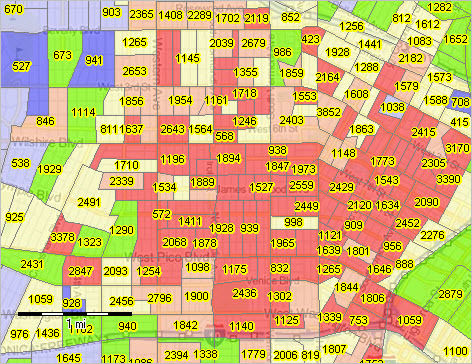 Census Block Groups sit in a “mid-range” geography between census blocks and census tracts. 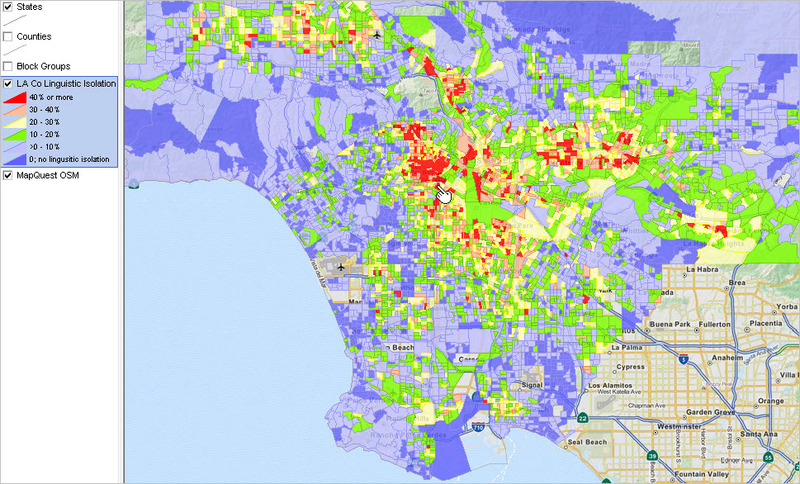 All cover the U.S. wall-to-wall and nest together, census blocks being the lowest common denominator for each. Block Groups (BGs) are the smallest geographic area for which annually updated ACS 5-year estimates data are tabulated. … omit this step if CV XE GIS software already installed. 4. 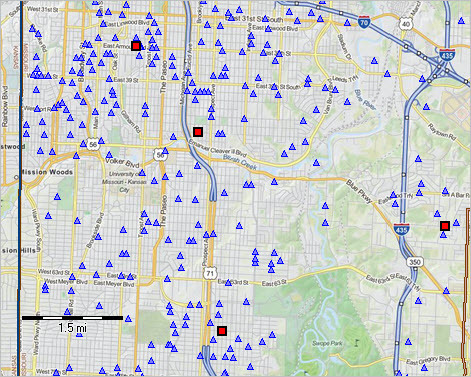 Done .. the start-up view shows the crime patterns. Join me in a Data Analytics Lab session to discuss more details about accessing location-based data and block group demographics and integrating those data into analytical applications. Learn more about integrating these data with other geography, your data and use of data analytics that apply to your situation. Linguistic isolation inhibits the ability of people and households to integrate into neighborhoods, cities and living areas. Opportunities for advancement and participation in society are improved where linguistic isolation is minimal. This section describes tools and data resources to examine patterns of linguistic isolation for block group level geography. Data used to analyze patterns of “household linguistic isolation” are based on the American Community Survey (ACS) 2014 5-year estimates at the block groupgeographic level. The same scope of subject matter is available for higher level geography. 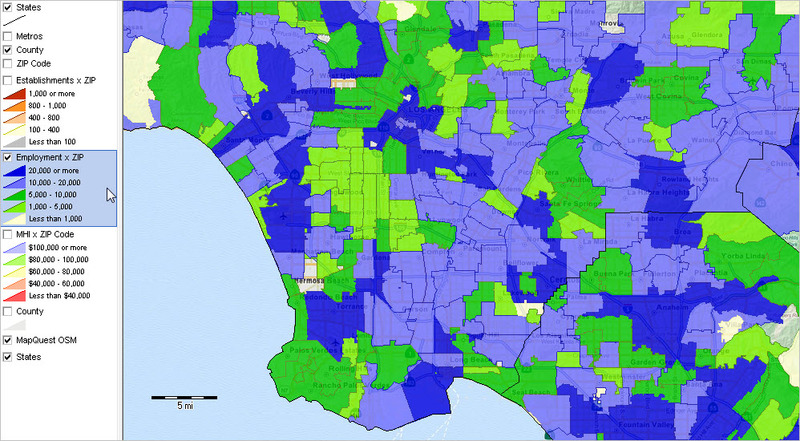 The following graphic shows patterns of linguistic isolation in Los Angeles County. Block groups colored in red have more than 40-percent of households where no household member age 14 years and over speaks English “very well”. Click graphic for larger view showing more detail and legend. — “Language Spoken” categories are based on four major language groups. At the end of this string is the text “state:06+county:037”. Change the state and county to “state:36+county:061” to access the data for New York County, NY (Manhattan); and similarly for any any county. The results of the API call are shown in this text file. These data are easily imported into an Excel file. 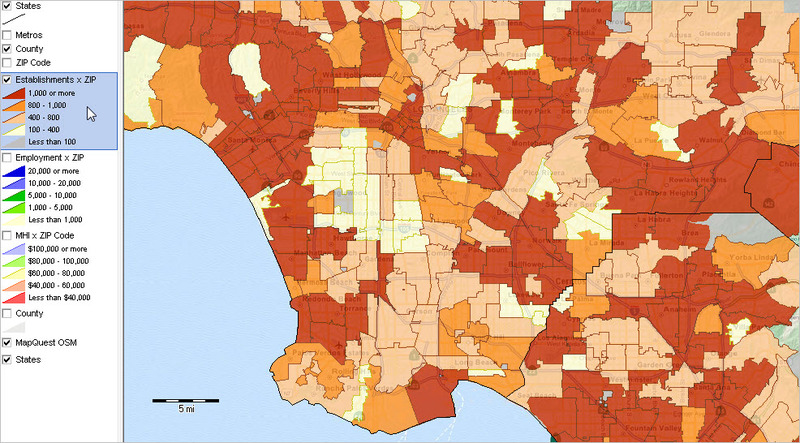 The DBF version of the data were integrated into the Los Angeles County 2014 block group shapefile using the CV XE GIS software dBMerge feature. The Layer Editor was then used to develop the map legend/color intervals. Join me in aData Analytics Lab session to learn more about these steps/operations. Join me in a Data Analytics Lab session to discuss more details about accessing block group demographics using API tools and integrating those data into analytical applications. Learn more about integrating these data with other geography, your data and use of data analytics that apply to your situation. .. the total population of the largest 50 U.S. metropolitan areas as of 2014 (latest official estimates) was 174,886,265. These 50 metros account for 58.3% of the population in all 917 metropolitan areas and 54.8% of the total U.S. population. By either measure, more than half of the U.S. population resides in these 50 metros. 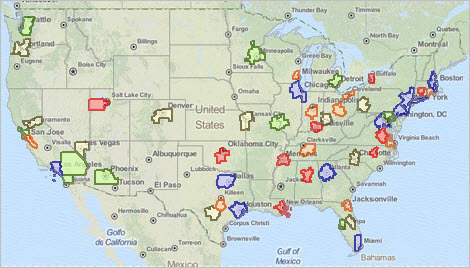 Use tools and data resources described in this section to view and analyze these metros. View the list of these metros by population rank in the scroll section provided below. Click on a metro link to view the Metro Situation & Outlook Report for that metro. The report provides extensive details on the geographic-demographic-economic attributes of the metro. 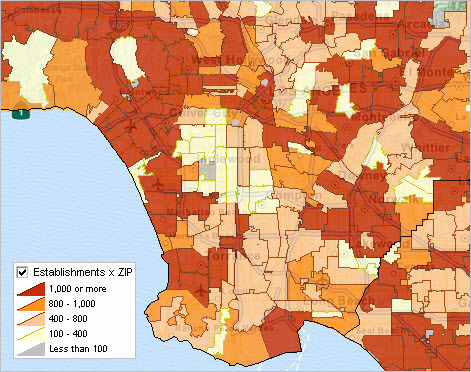 See details about using the largest_50_metros GIS project below in this section. The following graphic shows the 50 largest metros by 2014 population rank (blue metros are the largest 10). Click graphic for larger view, more detail and legend color/data intervals (expand browser window for best view). 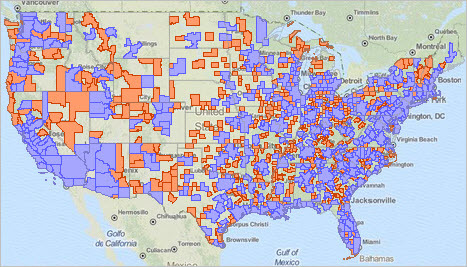 The following graphic shows all metropolitan statistical areas (blue) and micropolitan statistical areas (orange). Click graphic for larger view, more detail and legend color/data intervals (expand browser window for best view). The following graphic shows the percent change in total population from 2010 to 2014 for all metros. Click graphic for larger view, more detail and legend color/data intervals (expand browser window for best view). This map illustrates the relative ease to gain insights into patterns of population change using geospatial data analytics tools. Join me in a Data Analytics Lab session to discuss more details about using metropolitan area geography and using demographic-economic data. Learn more about integrating these data with other geography, your data and use of data analytics that apply to your situation.